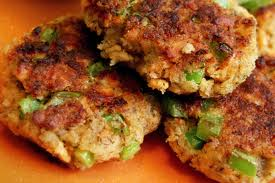 This version of salmon patties omits the crackers from a previously posted recipe to make a gluten- free entrée. Mash the salmon and eggs well with a fork. Stir in the onions. Fry in oil (enough oil to lightly cover the bottom of the pan) at med-med/low temperature. Fry four at time to make 8 patties. Garnish with mango relish, mango coconut pepper sauce or your favorite seafood dressing (tartar sauce, sriracha mayo ). Serve with rice or quinoa and salad. ~when i was a child growing up on the border of Mexico, mamá used to make these patties using dried powdered fish that was packaged in small cellophane bags and which can still be found in local stores. I didnt think of them as a treat then but now I can appreciate her efforts to put some protein in our diet. Combine eggs with salmon, toss in onions and crackers, and shape into patties, dropping them into a small amount of oil. Brown at med heat. Serve with tartar sauce, cole slaw (in a taco), a mango/onion relish, ketchup, or chipotle mayo.